Use buttons above to purchase an Angel Therapy Reading, Akashic Record Reading, Pet Communication Reading, or any of Kristin’s readings. Kristin is certified by Doreen Virtue as an Angel Therapy Practitioner and Medium. She can see, hear, and feel energy associated with Angels and life after death. Being able to communicate with loved ones that have passed on is healing both to the person still physically on this earth and to the loved one who has passed on. Because Angels only have your highest good in mind, connecting with them can give answers to questions about your life that you have. Your Angel will answer many question you have relating to guidance in your life. These include your purpose here, why you have connections with certain people in your life, lessons you need to learn, why you may be having a health problem and what to do about it, or struggles with love or money. Angels can also be a source of friendship in times of loneliness and wisdom when advice is needed and sot. Kristin is also certified as a Reiki Practitioner. Reiki is a great way to heal in times of low energy. It can also be used to facilitate physical healing. 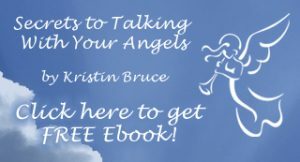 Kristin has written an e-book, Secrets to Talking With Your Angels, to answer many of the questions that she gets when she does readings. To receive this FREE ebook, click here. “How I Got My Wings” is an inspirational story about an Angel who is having doubts whether she will ever earn her wings. To do so she must help Bobby give an oral report, but this proves to be more challenging than she first thought. When Bobby refuses to give the report the Angel must look within herself to find her power and help Bobby get in touch with his as well. This is a “you can do it” story that will touch the hearts and minds of children young and old. Anyone who has ever suffered from self doubt will instantly relate to this book. The beautiful pictures and rhyming couplets make it fun to read over and over again. Kristin Bruce is a school counselor who teaches self-esteem classes to youth of all ages. Kristin has written this series of books to allow teens to know that they are not alone in their struggle to become adults. She encourages young adults to think positively and reach their fullest potential as anything is possible. Click here to purchase How I Got My Wings. Use the buttons below to purchase healing tools from The Angel’s Path. May these assist you in your spiritual journey! This is a CD with two guided imageries to help you meet your Angels. Learn the name of every Angel that is with you and speak with them on a personal level. Listen to these imageries each and every time you need guidance or help from your loving Angels and you will find what you are seeking. Track One: What is guided imagery and how can Angels help your life? Track Two: Meet Your Angel – Learn how to communicate with your Angel anytime, anywhere. Track Three – Balloon Ride with Your Angel – Meet your Angel and get your questions answered. “I listened to meet your angels and I thought it was great. I went on a nice peaceful relaxed journey. It was really nice. This CD is so wonderful I think it should /could be in every family.” – Holly M.
This is a CD of guided imageries written for the pregnant mother, father, and their unborn child. A collection of three imageries designed specifically for pregnant women and soon to be mothers and fathers. Track One: What is Guided Imagery? Track Two: Having a Baby – An imagery designed for relieving physical pain and symptoms caused by pregnancy. Track Three: Meeting Your Baby – Designed to release fear of becoming a parent. Track Four: Giving Birth – Designed for the mother to have a smooth delivery. During this workshop you will release the people from your past relationships, clear physical and energetic blocks toward letting romantic love into your life, and invite your soul mate in. In this workshop you will meet your Angel and get loving answers to any questions you may have. Learn how to connect with your Angel at any time and any place. Use the button below to purchase a gift certificate to use at The Angel’s Path.